Ideal for overhead valves that tend to stick or are otherwise difficult to operate. 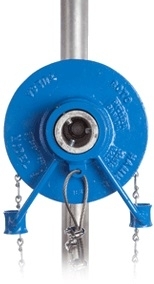 Available in chain model (for operation above ground level) or handwheel model (for ground level operation) Either style (chain or hand model) may be ordered for Clamp-On or Direct-Mount installation Direct-mount models are furnished with an adapter plate that replaces the existing handwheel. This plate can be supplied blank or machined to fit the valve. If fitted, dimensional information is required.